Four Course Banquet. 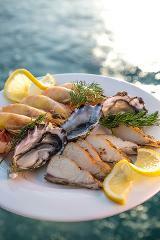 Pre Dinner dips, Gulf Banana Prawns, hickory smoked Spanish Mackerel, coffin bay oysters, fish of the day and Scotch Fillet steaks. Espresso Coffee/selection of teas and a tropical fresh fruit platter. 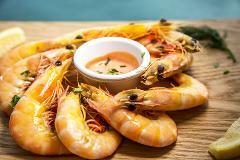 Homemade dips followed by a Platter of Gulf Banana Prawns accompanied by a seafood sauce and fresh crusty bread. Espresso coffee/selection of teas available. Join our evening sunset cruise to experience the best of Darwin harbour and surrounds. Includes Chef prepared dips, tea, coffee and an informative commentary. 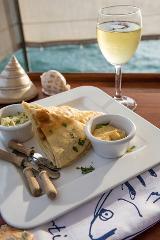 BYO and fully licensed, Guests are welcome to self-cater.